Senate Square is the most popular tourist destination in Helsinki, the capital of Finland. The grand statue at its center remembers a ruler of Russia, which exercised control over the country for more than a century. After defeating Sweden in 1809, Russia gained control of Finland and made it a duchy, with the Russian czar as duke. In 1812, Czar Alexander I moved the Finnish capital to Helsinki because of its proximity to St. Petersburg. Because much of Helsinki had been destroyed during the war, the czar engaged C. L. Engel, a German-born architect, to design a new city center to match the city’s growing importance. Engel designed a plaza known as Senate Square surrounded by neoclassical buildings, including the Government Palace, the main building of the University of Helsinki, the National Library of Finland and the Helsinki Cathedral. The Cathedral, with five green domes and statues of the twelve apostles on its roof, was modeled after St. Isaac’s Cathedral in St. Petersburg. 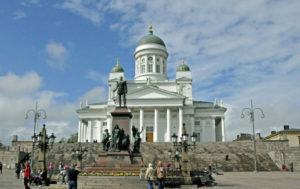 Completed in 1852, the Cathedral is the most famous building in Finland, attracting 350,000 visitors a year. In 1894, after Czar Alexander II was assassinated in St. Petersburg, the residents of Helsinki erected a statue of him in the middle of Senate Square to recognize his re-establishment of the Diet of Finland in 1867. The love affair with Russia was short lived. In 1899, Czar Nicholas II began the “Russification of Finland,” cracking down on Finnish autonomy. In protest, residents of Helsinki put flowers at the feet of Alexander II, whom they considered the “good czar.” After Finland gained its independence from Russia in 1917, some people thought keeping a Russian czar in Senate Square was inappropriate. But Helsinki residents decided to maintain the statue and plant colorful flowers at its base, continuing to honor his efforts on their behalf.